Abortion will be legal in Ireland before the Budget in October, Independent.ie understands. The Government is to bring forward the target date for implementing legislation on the back of the referendum landslide. A substantial number of Fianna Fáil TDs who campaigned against the introduction of terminations up to 12 weeks are now prepared to facilitate the proposal. Health Minister Simon Harris will meet with officials today to discuss the fastest way of regulating the abortion pill and establishing clinical guidelines for GPs. There is even an “outside chance” that legislation will be introduced before the Dáil breaks for the summer in mid-July. 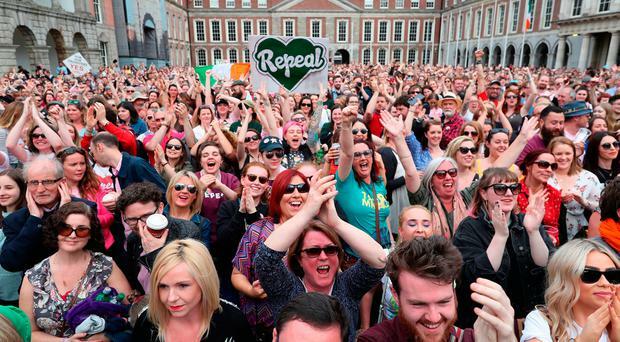 However, sources familiar with the process said it was “more likely” that the legislation would be published during the break with a view to having it debated in the Dáil and Seanad in September. The new deadline will ensure that people’s vote is acted upon in advance of the final Budget under the confidence and supply arrangement between Fine Gael and Fianna Fáil. All the signals were last night that TDs on the No side will not make any attempt to obstruct the legislation, raising hopes that it will be passed within weeks. Among the Fianna Fáil TDs to tell the Irish Independent that they will either abstain or back the bill were Pat Casey, Kevin O’Keeffe, Bobby Alyward, Declan Breathnach, John McGuinness, Charlie McConalogue, Willie O’Dea, Marc MacSharry, Eugene Murphy and deputy leader Dara Calleary. How Did Your Constituency Vote? Thomas Byrne, Anne Rabbitte and Mary Butler have also previously indicated they will not attempt to delay the new laws. Eamon Ó Cuiv, who was among the most vocal opponents of the referendum, refused to state a position. But Independent TD for Kerry Danny Healy-Rae, who is currently at the centre of a row filibustering on tougher drink-driving laws, said: “There was an overwhelming majority in favour. The table below shows the top five constituencies with the strongest vote for or against repealing the Eighth Amendment. The Department of Health is to immediately begin work on putting the infrastructure in place to facilitate abortions in the health service. Clinical guidelines will have to be drawn up by the medical colleges for the GP-led regime. These will include a 72-hour ‘pause period’ before a doctor can prescribe the abortion pill. The Health Products Regulatory Authority will also be asked to devise a system for the administration of the tablet, which is currently illegal here. And Mr Harris will be under pressure to tighten up parts of the draft bill produced before the referendum. In particular, it is expected that the final version will give a much clearer definition of ‘viability’ than is currently the case. Speaking to the Irish Independent, Mr Harris confirmed: “I’ll be meeting with senior officials today to identify and plan the next steps. The minister said he also hoped to “reach out” to opposition parties later this week because “we are all united with the same goal here”. Meanwhile, the National Association of General Practitioners is to call an emergency meeting of its 2,000 members in the coming days to discuss what impact the decision might have. The body said it wanted to engage with the department to establish a “respectful, safe and supportive pathway for women in crisis pregnancies”, but that family doctors had some concerns over resources. Meanwhile, it has emerged Canadian Prime Minister Justin Trudeau phoned the Taoiseach on Saturday to congratulate him on the referendum result. Mr Trudeau urged Leo Varadkar to liberalise Ireland’s abortion laws when he visited Dublin last year, saying choice was a “fundamental human right”.